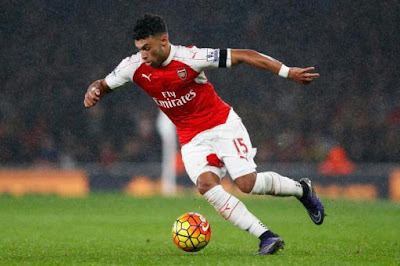 Alex Oxlade-Chamberlain has suffered a setback in his recovery from a hamstring injury, ruling him out of Arsenal's Barclays Premier League clash at West Brom. The England forward, who suffered the injury in the Capital One Cup loss to Sheffield Wednesday, is also expected to miss the key Champions League clash with Dinamo Zagreb next Tuesday. Arsenal boss Arsene Wenger said: "He had a slight little setback on Monday but we checked by scan and there is nothing wrong but he is still a fraction short for Saturday." Aaron Ramsey - who has been absent since the October 20 win over Bayern Munich - is likely to be fit to face Dinamo but Oxlade-Chamberlain will be available for the following weekend's clash with Norwich at the earliest. "Ramsey will be back in full training on Monday and can play on Tuesday and Chamberlain I think against Norwich," Wenger added. Theo Walcott, who injured a calf in the same game as Oxlade-Chamberlain, is still continuing his rehabilitation. "Theo is ahead of schedule at the moment but he is still two weeks away," Wenger added. It all piles more pressure on the likes of Alexis Sanchez, who was due to return from international duty with Chile around 36 hours prior to the match at the Hawthorns. Chile lost 3-0 to Uruguay after a 1-1 draw with Arsenal goalkeeper David Ospina's Colombia during the international hiatus. Sanchez is becoming ever more important to Arsenal and Wenger wishes to give him some time off, but is unable to at present. Asked if the former Barcelona forward will be granted some leave, Wenger said: "At some point yes. At the moment I am a bit short because (I have) no Chamberlain, no Ramsey, no Walcott, no (Jack) Wilshere, no (Danny) Welbeck. "There is not many offensive positions where I can rotate. "I am worried because when he went to Chile he was already a bit jaded and to see what state he will come back (in), I will have to test. "But speaking to the player, if I ask him 'are you tired?' you can guess the answer." Sanchez will not be flying off on national service until March at the earliest, giving Wenger complete control over his welfare. "That is welcome that there is no international break now," he added. There has been some good news on the injury front, with right-back Hector Bellerin available following a groin problem.